Riesling remains relatively unpopular in this country, and I must admit even I can sometimes be peremptorily dismissive of a glass of this variety myself. A lot of us associate the grape with cheap, sweet, insipid wines like Blue Nun and Liebfraumilch, and so when we drink a Riesling, even a very good one, it can be easy to just quaff it without paying attention. Steinfelder is a light wine up to 11% alcohol for easy drinking. Federspiel is made from slightly riper grapes, 11.5-12.5% (stronger than it used to be), good in its first five years. Wines labelled Smaragd (after a local green lizard), can be seriously full-bodied, with alcohol levels above — often far above — 12.5%; they repay six or more years’ ageing. 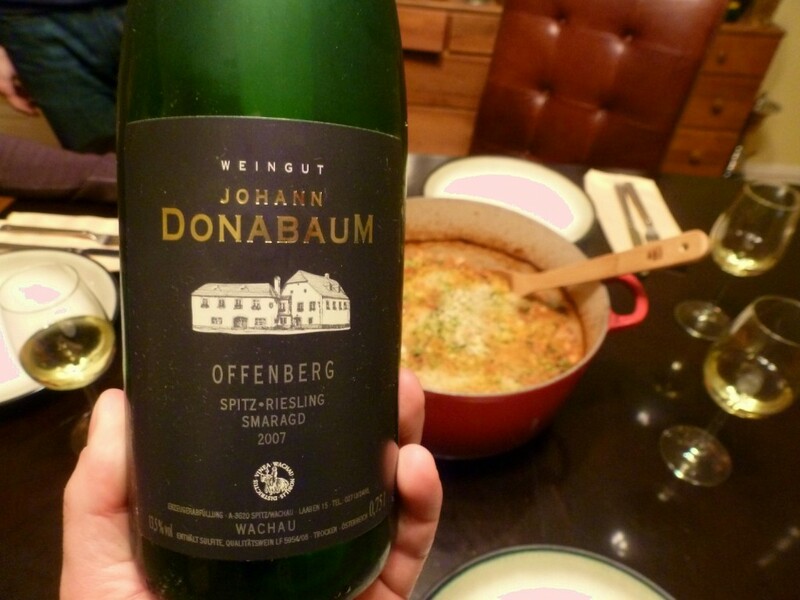 We recently partook of the little green lizard, a 2007 Johann Donabaum Offenberg Riesling Smaragd. Johann Donabaum calls Offenberg its “most extreme [vineyard] location,” and goes on to explain how wines from this site, set a bit inland from the Danube, have a strong sense of terroir, particularly because of the soil’s slate content. We opened the Riesling with a meal of cassoulet, a wonderful French stew of white beans and meat topped with a crunchy crust of butter-infused breadcrumbs. I love cassoulet with lardon, garlic sausage, rabbit and duck confit, but I made a simpler version substituting bacon, kielbasa, ground pork and braised chicken thighs. Still delicious, and ever so much easier. I hoped the Riesling could stand up to this rather robust stew. The wine had an enticing aroma of honeyed apples, and a sprightly prickle on the tongue. A juicy, apply flavor gave way to honey, before finishing with some stone and even a little wood. It tasted rich, but ample acids kept this wine light on its feet. In spite of its four years of age, it felt young and could surely have handled another few years of aging without gaining a wrinkle. Unfortunately, the cassoulet did overwhelm the wine a bit. A Rhone white or a Chardonnay probably would have worked better. This Riesling would have probably been perfect with schnitzel, seafood (like scallops) or pasta with cream sauce. Austrian wines can be hard to ferret out — not all wine shops carry them. I did see a few on my most recent visit to Whole Foods, and many restaurants and wine bars now include Austrian options on their wine lists. Even if you think you don’t like Riesling, give an Austrian version a try. The little green lizard might just change your mind. 2007 Johann Donabaum Offenberg Riesling Smaragd: Its rich flavors are balanced beautifully with bright, food-friendly acids and a bit of stone. Not inexpensive, but a fine value. Chill well before serving. Find It: I purchased this bottle for $35 from Lot 18, an online wine merchant akin to Gilt Groupe. The Johann Donabaum website lists three retailers (one in Los Angeles and two in New York) who sell this wine in the U.S.